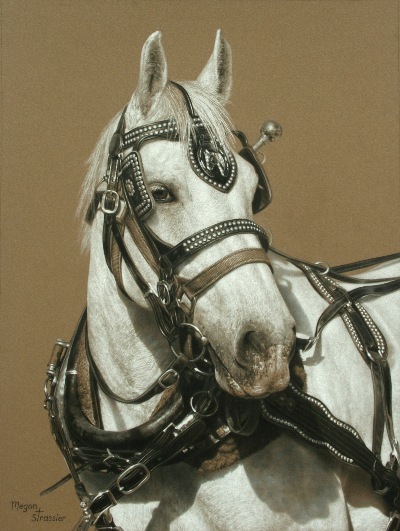 This pastel was a very exciting endeavor for me! 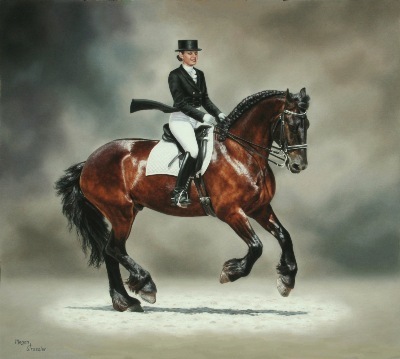 It was created for the AAEA's 2010 Spring Invitational Show, entitled "A Salute to the World Equestrian Games, 2010." 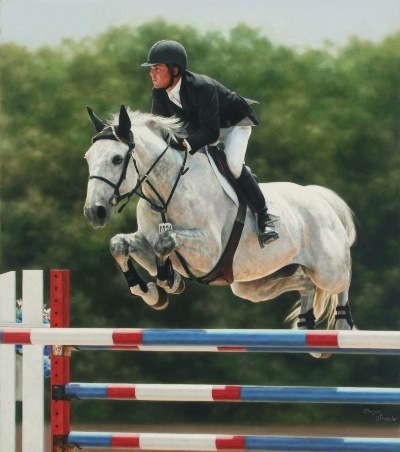 After being invited to this show, I knew I wanted to enter something that fit the equine competition theme. When I came across my photo of this horse and rider, I was struck by the determination and focus in their eyes, and I thought it would be perfect for the show. And that is how Eyes on the Prize came to be! 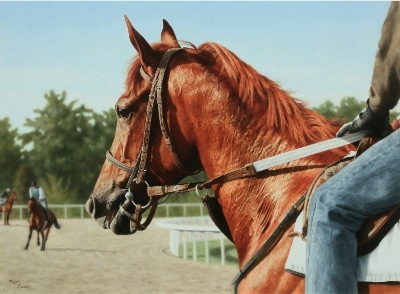 This is another thoroughbred that caught my eye one morning at Keeneland. 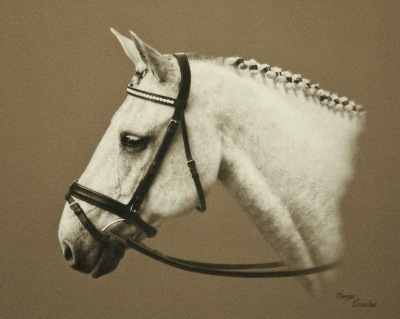 I loved the lighting and the horse's expression in this picture. He looked so eager for his morning workout and seemed to be soaking it all in! This is Pretty Boy Floyd, the resident Appaloosa at the Kentucky Horse Park. I was able to photograph him during the Parade of Breeds show. 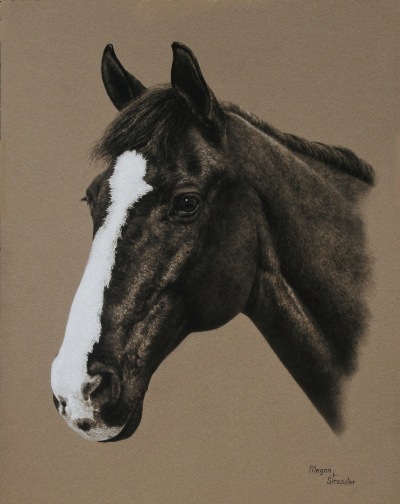 His coloring was so unlike anything I had done before, and I thought he would make an exquisite charcoal! 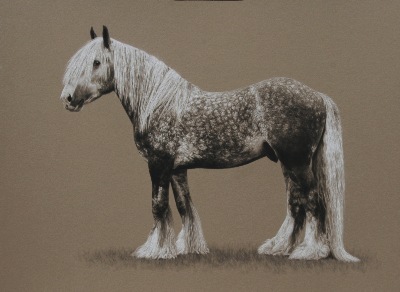 I had wanted to do another horse in charcoal, and I was immediately drawn to this gypsy cob. 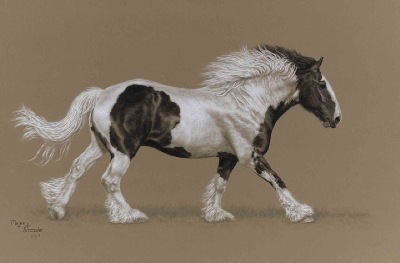 I loved his thick mane, tail, and feathers, and I thought his coloring would be interesting for a charcoal. 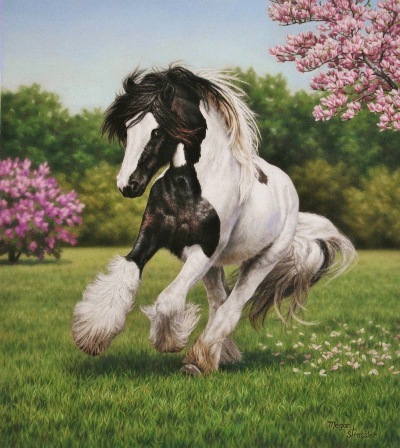 Doing his dapples was a much more tedious task than I thought it would be, but in the end it was all worth it! 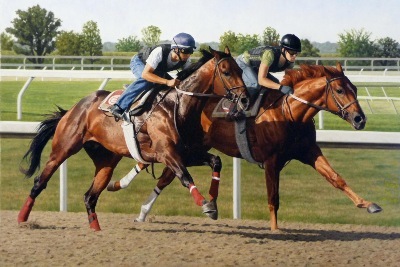 This painting captured Croton Road's victory in the 2007 VID Stakes. Croton Road is a stakes winner by Mr. Greeley, and his earnings have surpassed $200,000. His racing record also includes a 2nd place in the 2006 Calder Derby. Keeneland Race Course in Lexington, Kentucky, is one of my favorite places to photograph horses, and one morning I caught these two thoroughbreds putting in their morning breeze. Even though it was only a workout, they were giving a hundred and ten percent of themselves, and I wanted to capture their heart and competitive spirit. 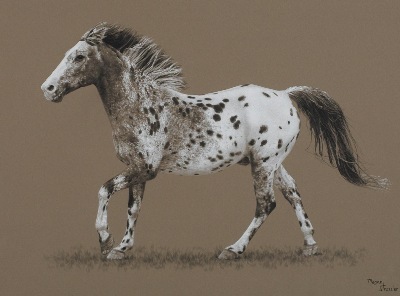 This pastel was inspired by my first visit to Assateague Island. It was breathtaking to see these wild ponies up close in their natural environment, and I so enjoyed putting together a scene of their everyday life. This pastel is so realistic, in fact, that at one art show the jurors had to bring in an expert to verify that it was a pastel and not a photograph. 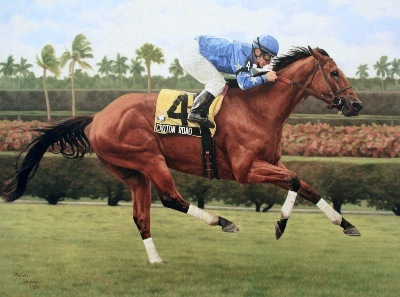 Afleet Alex was a major force in the 2005 Triple Crown. 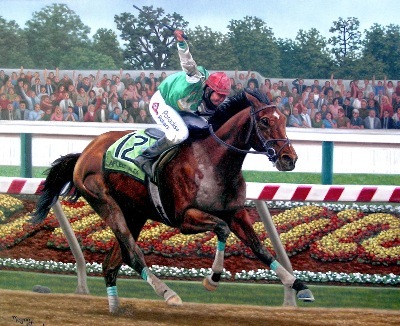 After he overcame a near-devastating collision with Scrappy T to capture an incredible victory in the Preakness Stakes, I knew I just had to paint him. 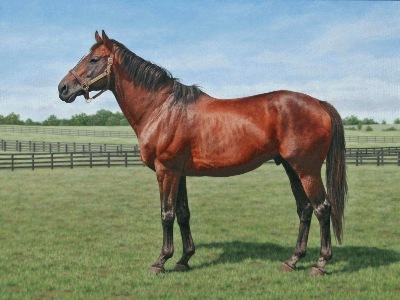 And so he became the subject for my very first equine oil painting. No copying or reproducing of images without the permission of the artist.